John Mulaney is best known for his work as a writer on Saturday Night Live and as one of the most popular touring comedians today. He has released several comedy albums/specials, including The Top Part (2009), New In Town (2012), The Comeback Kid (2017) and Kid Gorgeous (2018), for which he received a Primetime Emmy Award for Outstanding Writing for a Variety Special. In all, Mulaney has won three Emmy Awards, including two for his work on Saturday Night Live. He also frequently performs as a character called George St. Geegland in a comedic duo with Nick Kroll, most recently in Oh, Hello on Broadway from September 2016 through early 2017. 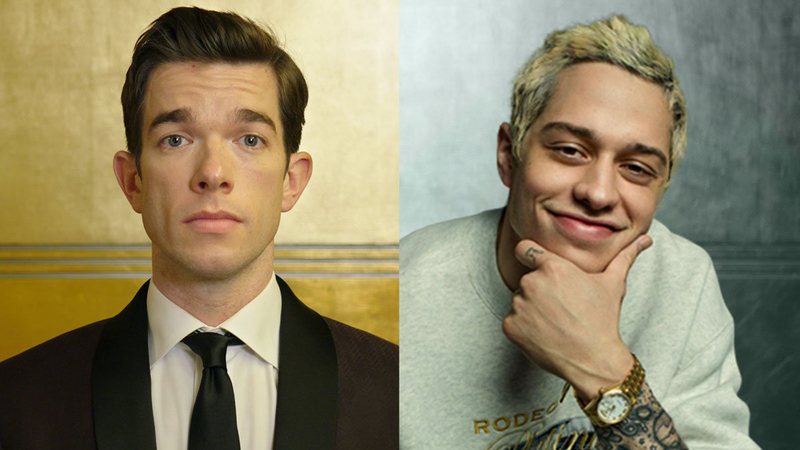 In 2018, Mulaney made his big-screen debut, voicing Peter Porker/Spider-Ham in the animated film Spider-Man: Into the Spider-Verse. Pete Davidson is a comedian and actor who is best known as a cast member on Saturday Night Live. He has performed stand-up comedy on Adam DeVine’s House Party, Jimmy Kimmel Live!, and Comedy Underground with Dave Attell. Davidson has also appeared on the MTV shows Guy Code, Wild ‘n Out, and Failosophy, and recently guest-starred in the sitcom Brooklyn Nine-Nine. He has been a regular on Saturday Night Live since 2014. Performance may contain adult-themed material. This show is not suited for minors.